Rizzoli International Publications, 9780847826827, 224pp. Imagine awakening in a castle. You slip out of your poster bed, open french windows and step onto a stone balcony. You take in the view of surrounding vineyards that slope down to a quaint tile-roofed village in the misty river valley below. This isn’t a dream. You can actually spend the night in an authentic French château or manor house, one with all the personal care of a bed-and-breakfast. For centuries, the country’s small châteaux have remained secret, closed to all but the families of the owners. But in recent years, in efforts to generate revenue for preservation, many families are throwing open the doors and inviting the public in to stay. French Country Hideaways takes you inside 35 of these hidden gems where you can experience true French country living. At these châteaux d’hôte you will meet the owner-innkeeper and get to know the individual spirit of the place. These off-the-beaten-track estates were selected because each possesses a unique bond to the land. None of the properties has more than fifteen guest rooms, and most offer table d’hôte meals in the evenings that showcase the specialties of the region. France remains the number one European destination for Americans, and its three most popular regions are the focus here. 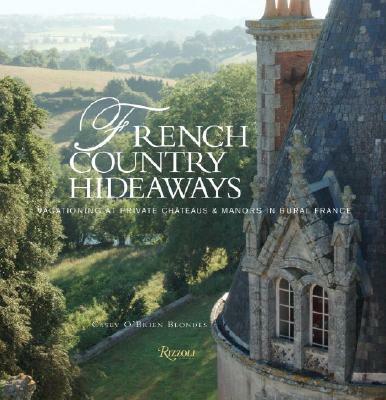 Gloriously photographed by Franco-American Stephanie Cardon and complete with listings for recommended nearby restaurants and activities, French Country Hideaways is a wonderful guide for those planning or just dreaming about a visit to these enchanted landscapes. Casey O'Brien Blondes moved to France from her native New York sixteen years ago with her husband. After several years in Paris, the couple moved to a restored farmhouse in the Loire Valley, where Blondes became immersed in the local culture.